The focus of the 2017 Canberra Heritage Festival is ‘Questions and Change’ and it celebrates the 50th anniversary of the historic 1967 referendum. While we celebrate what is often considered our greatest referendum many Canberrans would be aware that as Territorians we had no right to vote in it. 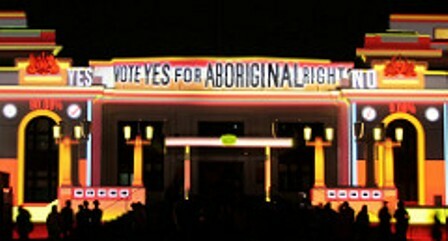 Canberra, however, has always been a progressive city, and while we were ‘not invited to the federal party’ this did not stop some of us from having a say, with reports of locals ‘crossing the border’ to encourage NSW voters to vote ‘Yes for Aborigines’. 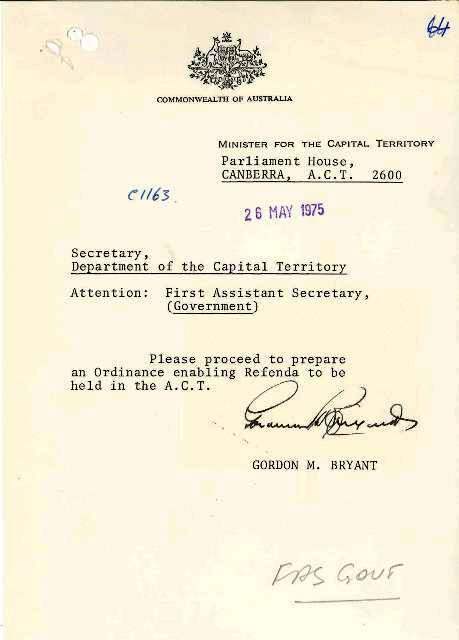 In 1974 the Minister for the Capital Territory, Mr Gordon Bryant, took matters into his own hands by starting the process to enable the ACT to hold local referendums. Papers documenting the government’s efforts to engage and work with the local population through the referendum process are ArchivesACT's Find of the Month. In 1901 the Federation of Australia saw the States (then colonies) agree to join together to form our nation. In doing so, the States were required to hand over their control of any issues of national significance to the Commonwealth. This requirement saw a considerable diminishing of their power, particularly in relation to taxes and trade. For example, the Commonwealth would be able to tax their citizens and there was no guarantee that this revenue would be spent within their State. To assuage the new states’ fears that their rights could be further diminished, the working group responsible for drafting the Constitution included a section (S128) which would allow the states a voice in any future amendments. Referendums would become the tool used by the Commonwealth to seek agreement on constitutional change, and required a majority of voters in the majority of states to agree to any proposed change. The territories were formed after Federation, and as they were funded by the Commonwealth, their citizens were not given a vote in constitutional referendums. This must have been particularly disappointing for residents of the Northern Territory, who, despite being allowed to vote in the first three referendums, had their rights revoked when South Australia surrendered the area to the Commonwealth in 1911. 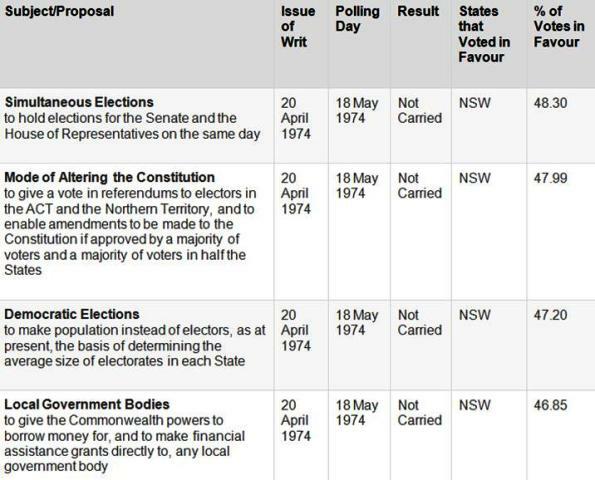 To date there have been nineteen constitutional referendums held in Australia which included a total of forty-four proposals. Of these, only eight amendments have been passed. The first referendum was held in 1906, and the last was in 1999, which included the proposal to establish Australia as a Republic. Local business leaders and politicians had extensively lobbied the federal government over several years to allow territorians a vote in referendums. Arguments to the negative included suggestions that territorians didn’t really want to participate, that they were too small to be counted as a state, that the Constitution was an important document and that territory votes were not significant enough to allow for constitutional change. Despite the naysayers, proposals were twice raised to amend the Constitution to change the voting rights of territorians. The first proposal was put forward by the Whitlam government in the 1974 referendum as part of a joint proposal to change the requirements for amending the Constitution. It was unsuccessful. Three further proposals were also presented in this referendum, prompting discussion that the rights of territorians had been overlooked while people discussed the other large and complex issues that were presented at the same time. In 1974, The Honourable Gordon Bryant was the Minister for the Capital Territory. Bryant was a career politician and a staunch advocate for Aboriginal rights, who often contributed publicly to the debate. In 1957 he was present at the meeting of the Australian Aboriginal Fellowship which launched the petition requesting the Australian Parliament to hold a referendum. He volunteered to become the national organiser of the campaign and was instrumental in the lead-up to the 1967 Referendum. Although Bryant’s proposal was well received by Cabinet in theory, members denied the proposal as it stood and instead suggested that the Minister focus on the “general question of referendums in the ACT” rather than confine the issues to the topics in the brief. The decision would significantly delay the development of an ordinance, and by the time the final draft of the Referendums Ordinance 1976 was prepared, a change of government had taken place and Bryant’s momentum was lost. Over the next two years, the draft ordinance was essentially shelved. It wasn’t until 1978 that the Honourable Bob Ellicot, as the Minister for the Capital Territory, resurrected and amended it to become the Referendum (Self-government) Ordinance 1978. 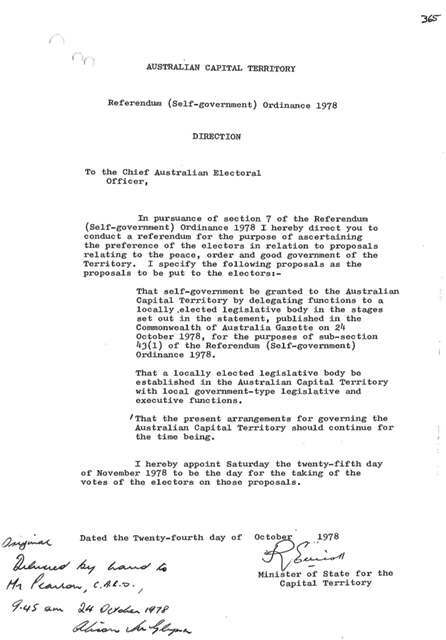 The referendum was announced on 24 August 1978 before the ordinance had even been finalised, and was held on 25 November 1978. This short time frame prompted some criticism of the process including the limited information available regarding financial administration, the complexity of the proposals and the sense of urgency which would all potentially affect the outcome of the vote. The outcome of our first referendum may well have been influenced by these factors with the majority of the population (63.75%) voting in favour of continuing under the existing arrangement. Although Bryant’s original proposal to allow voters in the ACT a voice was ultimately successful, his wider plan to involve citizens in the democratic process on local issues was not fully achieved. In the years to follow only two more local referendums were held, one in 1992 and the other 1995, None have been held on the more community-centric issues that Bryant originally envisioned as useful. While advances in technology and social media now allow us the opportunity to engage more than ever as a community, to protest, support and ultimately invigorate local debate, the ACT Government is considering whether citizen juries might be a mechanism for including unheard voices in public debates For a progressive, inclusive city like Canberra, there can be many ways to be heard. If you are interested in finding out more about the history of referendums in the ACT, or you would like a copy of any of these records please contact ArchivesACT through our “Request a Record” service. Williams, George & Hume, David (2010). People Power the history and future of the referendum in Australia. UNSW, Sydney.